1) Acting - Total Thumbs Up: Christoph Waltz, Samuel L. Jackson, Alexander Skarsgård, and Margot Robbie all gave great performances for the film. They made for a great cast combination. Everyone involved did a great job. Due to how the story unfolds, Mr. Skarsgård show us different facets of Lord Greystoke. Including the battle he wages internally between the life his parents wanted for him and that which he lived in his youth. Margot Robbie plays the American raised in the Congo and Tarzan's love, Jane. Fighting her own battles during the adventure, Margot does a great job going toe-to-toe with Christoph Waltz. Samuel L. Jackson added a lot of the comedic touches as well as pulled out pieces of Tarzan's story for the audience. Watching him deal with his wounded pride as the 'ignorant natives' prove much more hardy and crafty than he expected was fun to watch. The Mangani apes were fabulous. Each was distinct enough the audience could easily tell which was which. Kala's, Kerchak's and Kala's ape son's expressions and body language spoke volumes. But the most impressive special effect, in my opinion, had to do with Tarzan's hands. Living among the apes since he was a baby, Tarzan's muscles and bones developed differently from the human norm. The hands appear more like a gorilla's. Though an unspoken thread in the plot, the fact Kala gave him a rock to help him shape his hands so they could be more effective makes a large impact. It is quietly referenced several times and is a facet of his inner struggles. 3) Plot/Story - Total Thumbs Up: Per the Edgar Rice Burroughs website there have been 41 Tarzan films and 57 one-hour television episodes made. So rather than do the expected origin story in this film, the writers took a different route to get us acquainted with the characters. One that I think made the film different from other retellings and worked well to craft a good film. Rather than as the Lord of the Jungle, we meet John Clayton as Lord Greystoke. He's been years away from the Congo and has been serious in taking care of his duties as the heir of Greystoke. John has embraced the land of his birthright as if he'd never been anywhere else. He is refined, well educated, intelligent. With small flashes back to his time in the jungle, we do get bits about his origin. But they take a back seat to the overall story arc, so it enhances what is going on, but doesn't over shadow it. Jane's love for the people and country she was raised in was a lovely surprise. Her relationship with the small village her father taught in was bright and heartfelt. You could feel they were all family. 4) Stunts - Total Thumbs Up: While many of the stunts are CGI, there were still plenty of real stunts to keep the department quite busy. Fights, gunplay, avoiding stampeding animals - they had plenty to keep them occupied. 5) Locations/Cinematography - Total Thumbs Up: Between several locations in England and those in Africa, there is much to delight the eyes. Add in some CGI and all the vistas were quite impressive. Long panned views of the grasslands, aerial shots of the jungle, or just pockets in the trees - every shot told its own story. In fact, towards the end, they actually do. 6) Costuming/Makeup - Total Thumbs Up: From presenting Lord Greystoke in his finery to slowly divesting him of clothes, the department did some nice costuming work. The makeup was excellent as well. They gave the different tribes their own distinct looks, helping to show their diversity. The work on Tarzan's bite from both the special effects and makeup department was outstanding. 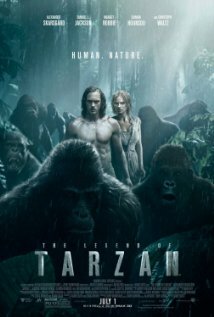 Conclusion: The Legend of Tarzan is a lovely new take on the old tale. There is lots of action, cool vistas, villains, and heroes. All the fun things that have made Tarzan the icon he's been since the first story hit the stands back in 1912.